I've mentioned before how much I love rainbow chard. We got a big batch with our CSA box last week, and I cooked it up this weekend using Simply Recipes' easy instructions (found via Food Blog Search), along with pasta, homemade tomato sauce, and chicken breasts. I just love the texture and flavor (and color!) of chard. Will definitely be making this one again. Note: I used 1 tsp of olive oil instead of the full 2 tbsp, and it was more than enough. I also omitted the butter. 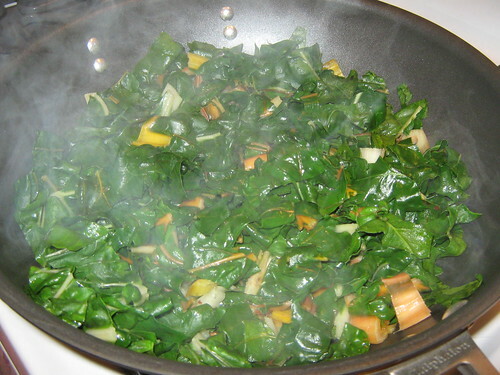 1 Rinse out the chard leaves thoroughly. Remove the toughest third of the stalk, discard or save for another recipe. Roughly chop the leaves into inch-wide strips. 2 Heat a saucepan on a medium heat setting, add olive oil, a few small slices of garlic and the crushed red pepper. Sauté for about a minute. 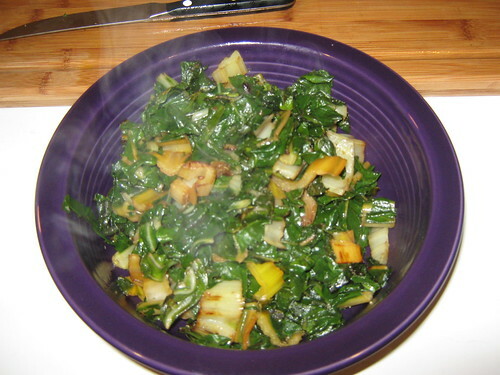 Add the chopped chard leaves. Cover. Check after about 5 minutes. If it looks dry, add a couple tablespoons of water. Flip the leaves over in the pan, so that what was on the bottom, is now on the top. Cover again. Check for doneness after another 5 minutes (remove a piece and taste it). Add salt to taste, and a small amount of butter. 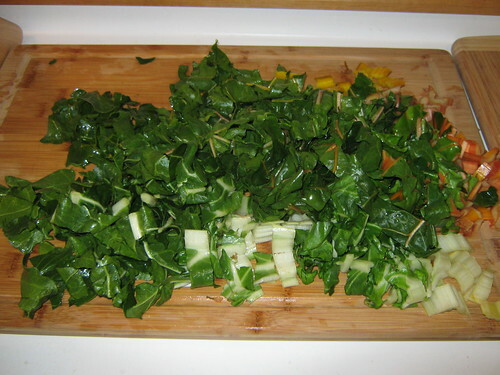 Remove the chard to a serving dish.